The Roman Emperor Marcus Aurelius had a lot to worry about. His adoptive father, Antoninus Pius, by contrast, had enjoyed a famously peaceful reign. Marcus was not so lucky. It seems that Fate tested him with one catastrophe after another. The historian Cassius Dio praised Marcus because he calmly persevered despite having to endure such appalling misfortune. 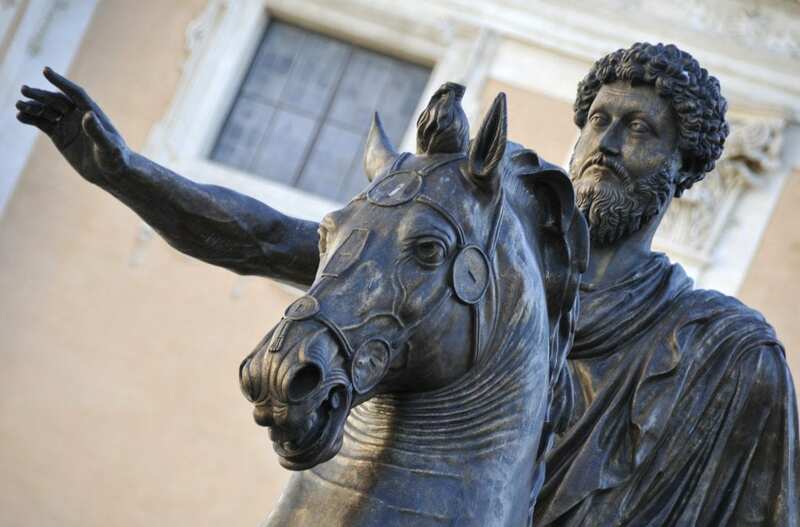 [Marcus Aurelius] did not meet with the good fortune that he deserved, for he was not strong in body and was involved in a multitude of troubles throughout practically his entire reign. But for my part, I admire him all the more for this very reason, that amid unusual and extraordinary difficulties he both survived himself and preserved the empire. These problems began shortly after Marcus was acclaimed emperor, when the Parthians invaded the Roman client-state of Armenia, triggering a war that would last five years. On top of this, around the same time, the River Tiber had one of the most severe floods in its history. Many homes were destroyed, and livestock lost, which brought about a famine at Rome. After suffering some humiliating initial defeats, the Romans were eventually victorious against the Parthians. Nevertheless, celebrations were short-lived because it became clear that the returning legions had brought back a deadly contagion from the east, which became known as the Antonine Plague. Modern scholars believe it was perhaps a strain of smallpox and it’s estimated to have claimed as many as five million lives throughout the empire. This, in other words, was an extremely difficult time for everyone, including the emperor. Even worse, with the legions still recovering from the war in the east and crippled by outbreaks of plague in the army camps, numerous hostile tribes to the north seized the opportunity to band together and attack the Romans. Led by King Ballomar of the Marcomanni they launched a massive invasion, overrunning the northern provinces and slaughtering 20,000 legionaries in a single day at the ill-fated Battle of Carnuntum. The invading tribes looted and pillaged their way down the Amber Road, through Pannonia, across the Alps, and into Italy itself, finally laying siege to the wealthy Roman city of Aquileia. Rome must have been thrown into total panic. However, the war would not be over quickly. Over a decade later, Marcus was still fighting the Marcomanni, Quadi, and Sarmatians along the River Danube, to try to secure the Roman frontier. These campaigns in the north, interrupted by a brief civil war in the east, became known as the First and Second Marcomannic Wars. However, the Historia Augusta described them as “The War of Many Nations”. It must have been an extremely stressful time for Marcus. By the time he’s writing The Meditations, though, perhaps a decade or more later, the tone has changed. Perhaps as a result of his Stoic training, Marcus has started exhibiting a different response to his anxieties. He frequently asks himself, very simply, “Why am I troubled?” Why worry about these things? He reminds himself that external events are not up to him, ultimately, and before long everything will be gone anyway. Although Cassius Dio says that Marcus faced a “multitude of troubles”, the Stoic emperor did not allow his mind to become overwhelmed by them but insisted, like Antoninus before him, on focusing upon one thing at a time. So how exactly did Marcus’ training in Stoicism help him to do this? However, sometimes he also deliberately pictures feared events in the future – a method Seneca called premeditatio malorum or the premeditation of adversity. We do the same thing in modern cognitive therapy, asking clients to imagine feared events as if they’re already happening. Therapists train their clients to stop worrying about the future, and to overcome their anxiety, by systematically confronting feared events in their imagination in a more controlled manner. There’s a way of thinking about our fears, in other words, that simply makes them worse, and another way that makes things better. We know that visualizing feared events for longer than normal, and doing this repeatedly, can lead to a process known as emotional habituation, through which anxiety abates naturally. However, Marcus also mentions several other Stoic techniques that can help us to cope with anxiety. His two favourite strategies are neatly captured in a short phrase, which is only six words in Greek: ὁ κόσμος ἀλλοίωσις, ὁ βίος ὑπόληψις. Translated literally it just says “the cosmos [is] change; life [is] opinion” but it means so much more. As we’ll see, Marcus appears to have condensed slogans representing the teachings of his two favorite philosophers into a pair of laconic (concise) sayings. This seems to be a reference to the doctrine of Heraclitus called panta rhei or “everything flows”, which Marcus refers to many times throughout The Meditations. Everything changes and nothing lasts forever. Why would this be important as a way of managing anxiety and other strong emotions? When we remind ourselves that something is temporary we’re forces to broaden our mental perspective to imagine it within a wider context in terms of its duration over time: beginning, middle, and end. We’re also forced to imagine both its presence and its absence. A growing body of modern psychological research shows that, by contrast, when we’re anxious our attention becomes more narrowly focused on perceived sources of threat. It’s as though we put our fears under a magnifying glass, which, of course, makes them much worse than they should be. Reminding ourselves to think of the bigger picture does the opposite, and remedies this emotional myopia. Our current fears then become diluted by being placed in a wider context, and our feelings become more rounded and less intense. Modern cognitive therapists do something similar by inviting clients to imagine the catastrophes they worry about and then repeatedly asking them “What would happen next?” Most worriers tend to have a habit of getting stuck as the worst-case scenario. However, when we patiently try to imagine as realistically as possible what would follow afterwards our anxiety usually becomes less overwhelming. Cognitive therapists call it “catastrophizing” when we blow things out of proportion and make threats seem more severe and overwhelming than they actually are. Questions that encourage us to re-appraise feared catastrophes in a more realistic and balanced manner are therefore called “decatastrophizing” techniques – they de-escalate the perceived crisis, until it is contained within reasonable bounds. Asking “What next?” and thinking about how things will change is one simple but powerful way of decatastrophizing our worries. This is certainly a reference to the trademark saying of Marcus’ favorite philosopher, the Stoic teacher Epictetus, who said: “It’s not events that upset us but our opinions about them.” Marcus doesn’t actually mean that everything is just subjective, as people sometimes mistakenly assume. On the contrary, that would actually be very much at odds with Stoic philosophy and the rest of Marcus’ writings. It’s clear that he means more specifically that certain types of underlying beliefs—mainly value judgements—shape our emotions and therefore affect our character and the quality of our life. That’s what Stoic philosophy teaches. This closely resembles a strategy called “cognitive distancing” in modern cognitive psychotherapy. (Behavioural psychologists prefer to call it “verbal defusion”, which amounts to the same thing.) This is a tricky concept to explain at first but it’s absolutely integral to modern third-wave cognitive-behavioural therapy (CBT), sometimes known as “mindfulness and acceptance-based CBT”. It’s the difference between looking at the world through the lens of a belief and looking at the belief itself. We can also say it’s the difference between thinking “This situation is a catastrophe!” and thinking “I am telling myself that ‘this situation is a catastrophe’”. Aaron T. Beck, the founder of cognitive therapy, used to explain the concept to clients by using the following analogy. Imagine you’re wearing rose-tinted spectacles or let’s say sad blue-tinted spectacles. People who are absorbed in their emotions just feel as though the whole world is actually blue because they forget they’re just looking at it through colored lenses. However, someone could look at the glasses instead of looking through them or just realize that the blueness isn’t part of external reality—it’s just being imposed on things by the lenses through which they’re gazing. Realizing that our thoughts are coloring our perception of reality is what’s meant by “cognitive distancing”: we’re creating distance or separation between thoughts and reality. This used to be considered an important precursor of cognitive therapy. We have to realize that our thoughts are just thoughts before we can begin to question them by asking “Where’s the evidence for that belief being true?” Someone whose beliefs are fused with reality doesn’t have enough cognitive distance to actually ask those sort of questions. For instance, they might just believe that life really is sad and blue rather than viewing it as a belief, a hypothesis, which could potentially be questioned or tested out somehow. Researchers in the 1990s, however, began to realize that this technique is much more powerful than clinicians had originally assumed. It seems that people often benefit just from cognitive distancing alone without necessarily having to go on to weigh up the evidence for their beliefs. Separating our thoughts from external reality, even by itself, can be enough to weaken the power they have over our emotions. Imagine someone is telling you a ghost story and you’re completely engrossed in every word they’re saying so much that the hairs on the back of your neck stand on end. Cognitive distancing weakens the story, though, as though you’re only half-listening. You still hear all the same words but they don’t have the same hypnotic effect on your emotions because you’re less absorbed in them. Worrying, of course, is like telling yourself a scary story and becoming completely lost in those thoughts for a while. So no matter how unrealistic or narrowly selective those worries may be, they have the power to leave us feeling highly anxious. The Stoics, therefore, warned us that we need to learn to take a step back from thoughts like these, not allowing ourselves to become entranced or be carried away by them. So the universe is change and life is opinion, Marcus told himself. Decatastrophize your worries by focusing on the temporary nature of the things that are bothering you, asking “What will realistically happen next: weeks, months, or even years from now?” Everything changes; this too shall pass. Also, gain cognitive distance between your upsetting thoughts and external reality by reminding yourself that “awfulness” is just a way of looking at things rather than something that actually exists in external reality. It’s just one perspective on events and comes from within you rather than from out in the world. Marcus had learned from his Stoic tutors that someone who genuinely masters these strategies can face even a “multitude of troubles” without feeling emotionally overwhelmed by them.